For whatever reason, job transfer, family size change or whatever, you need to sell your current home and buy a new one. The problem is that you have no idea how it will work. There are a few scenarios, but for a seamless move here is how it can and should work. First you list your home. Once you get an offer and go to settlement you start your hunt for the new place. 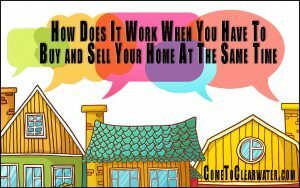 What that does is give you money to put down, a paid off mortgage and firmer standing with prospective sellers. Even though this is the safest plan to use, it does have drawbacks. First, you are basically homeless for a few weeks while you house hunt and wait for settlement. You have to put all your stuff in storage and rent somewhere, crash with family or friends or do a rent back deal with your buyers, if they can do that. Another plan could be you buy your next home, then sell your current home. This will mean you can move into your new home, prepare your current one for sale and not be homeless. This plan is great if you can afford the financial stress of two mortgages for some time and paying utilities and maintenance for two homes. This tends to be the plan for an out of state move. The last plan is probably the best, but the hardest one to pull off. It is selling and buying simultaneously. You put your home on the market and start your search. It takes good organization, timing and planning, as well as money available for preparing your current home for sale and money to put as a deposit. Your Realtor can be a huge help. There are ways to be sure you can afford this option. Planning settlement on both properties on the same day can keep the financial burden at bay. Plan your sale first, then your purchase. It also means working with your mortgage company for the new place so they know you won’t be stuck with two mortgages. Plan your sale and purchase.